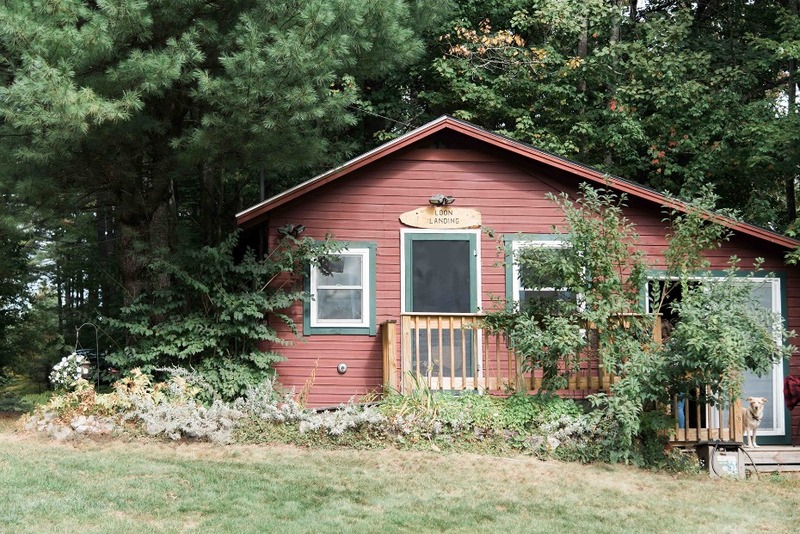 Imagine filling an entire summer camp with all your loved ones. Friends and family in every corner laughing and celebrating, brought together by your love one another person. How much fun would you have? Well if you are anything like Dana and Alicia the answer is "All the fun!" 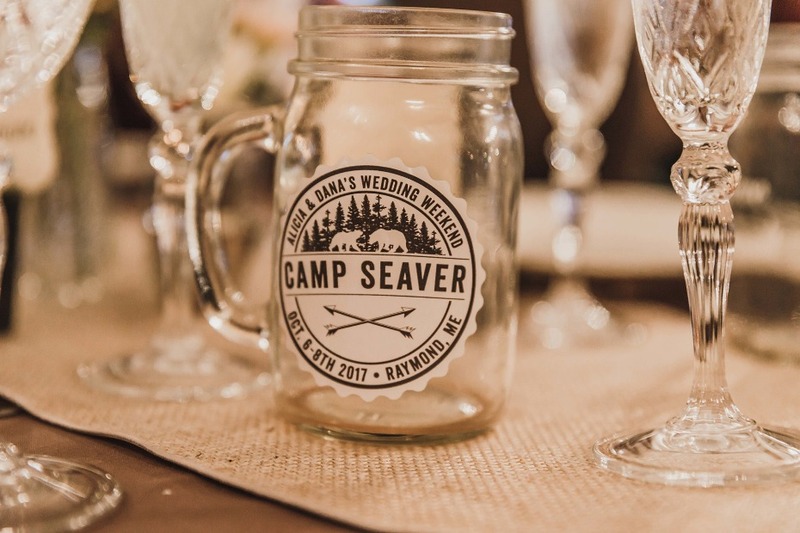 This next rustic summer camp wedding at Kingsley Pines Camp is one we won't soon forget. 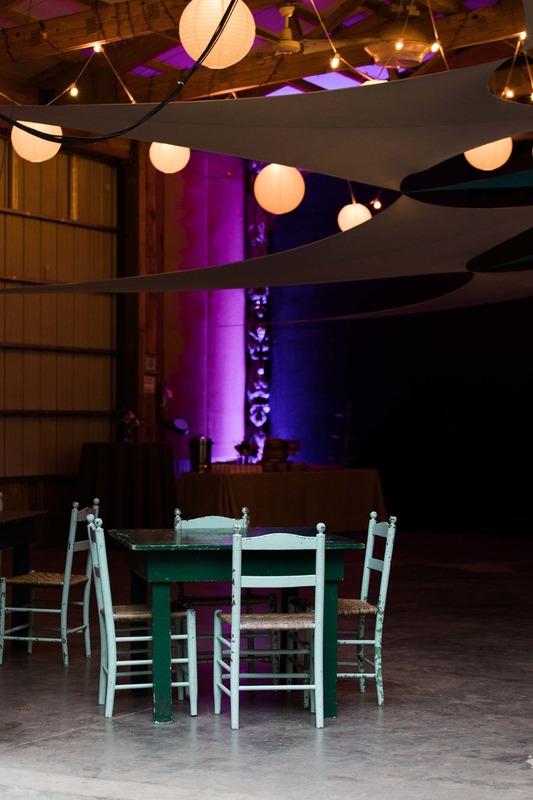 So keep scrolling to see what made this fabulous event so memorable. 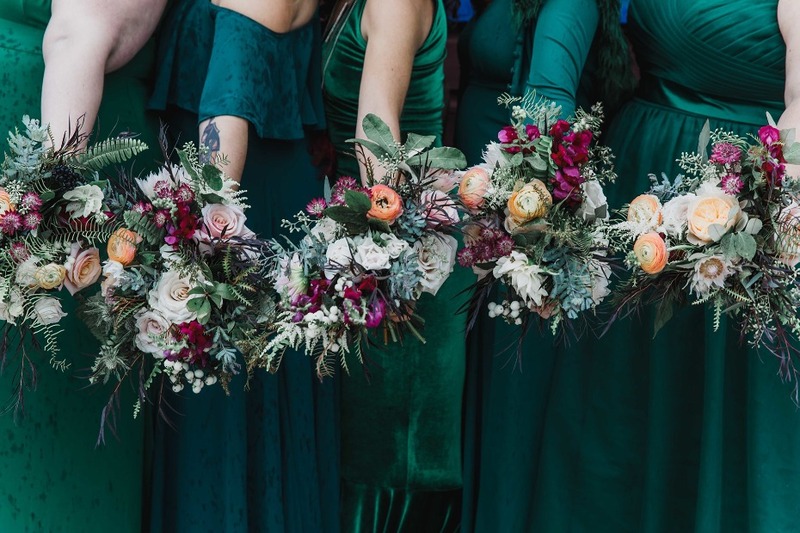 Oh, and don't miss out on the full gallery, filled with beautiful photos captured by Jessica Jaccarino Photography. 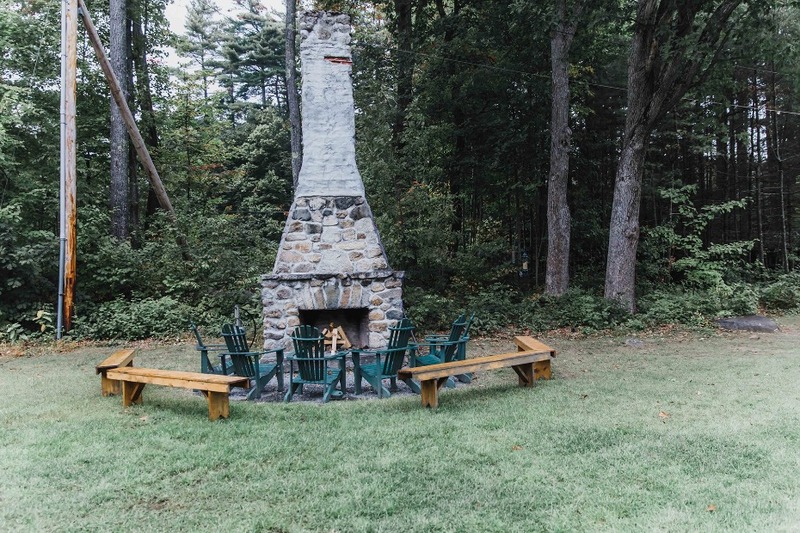 Dana and Alicia had a whimsical and rustic wedding at a beautiful camp tucked away in the woods of Raymond, Maine. 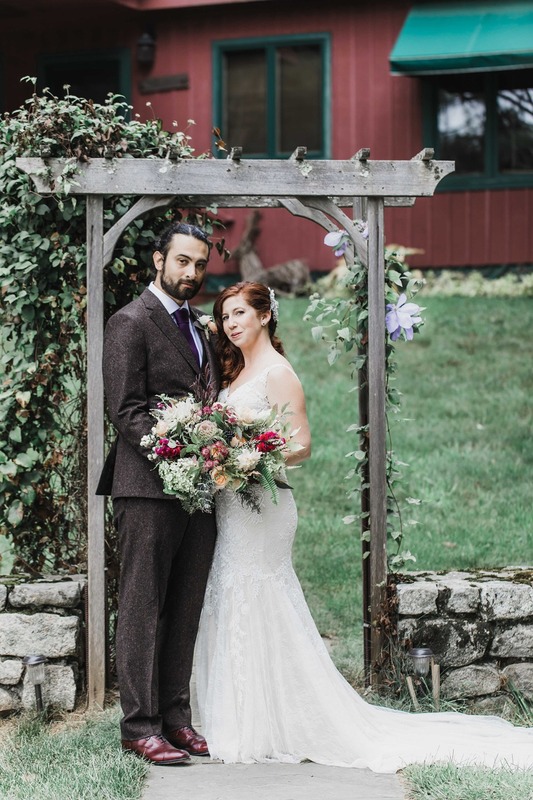 After meeting these two, it was so clear their wedding was not only going to be fun and unique, it was going to be real, raw and authentic. 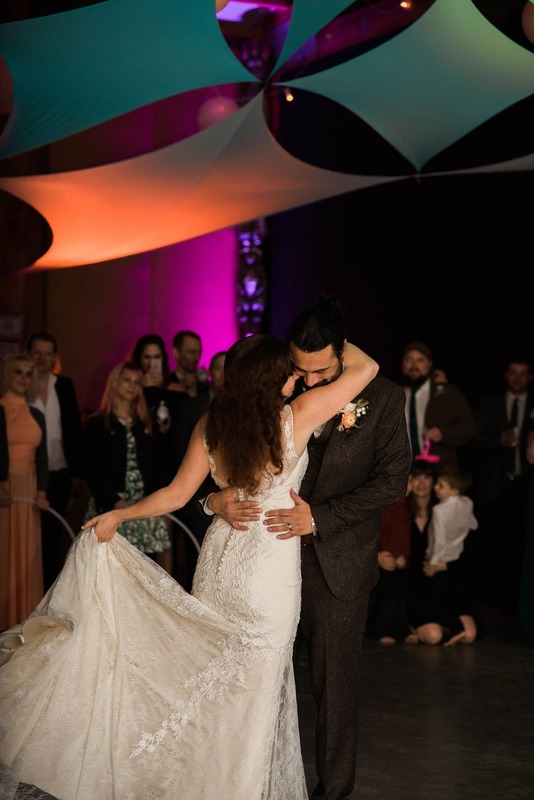 There was so much love at this wedding, a true work of art orchestrated by Alicia and Dana. 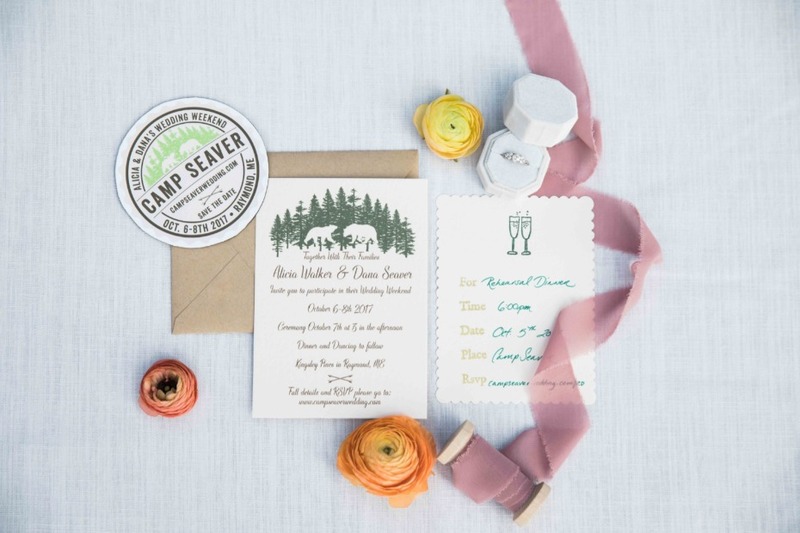 Alicia and Dana called this wedding #campseverwedding. 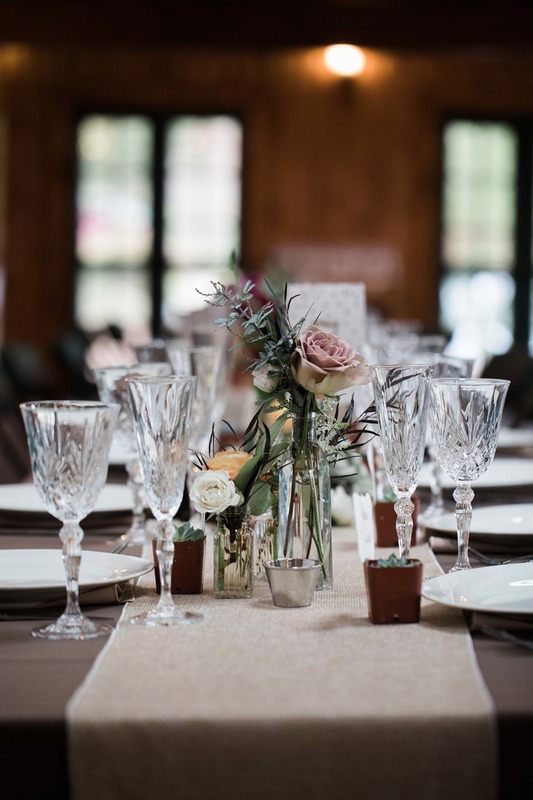 They sought a weekend away with friends and family, staying in cabins, relaxing and celebrating with them. 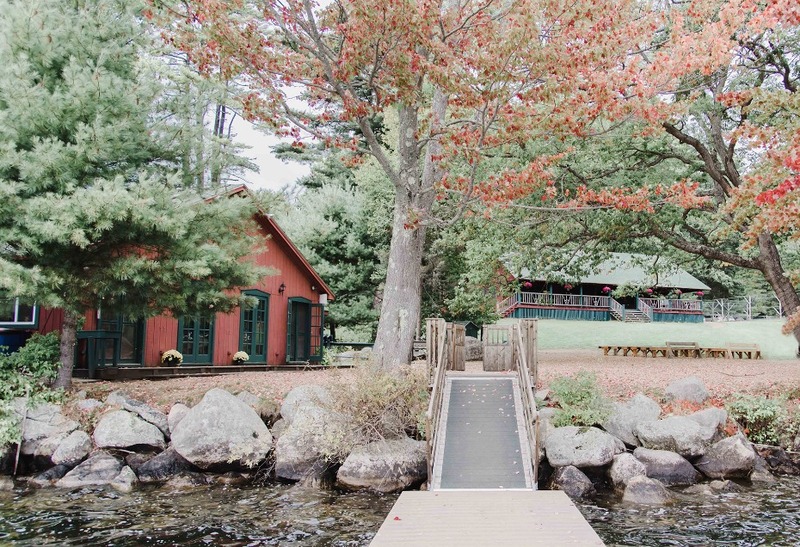 Being from Boston, Kingsley Pines was the perfect getaway retreat for them. 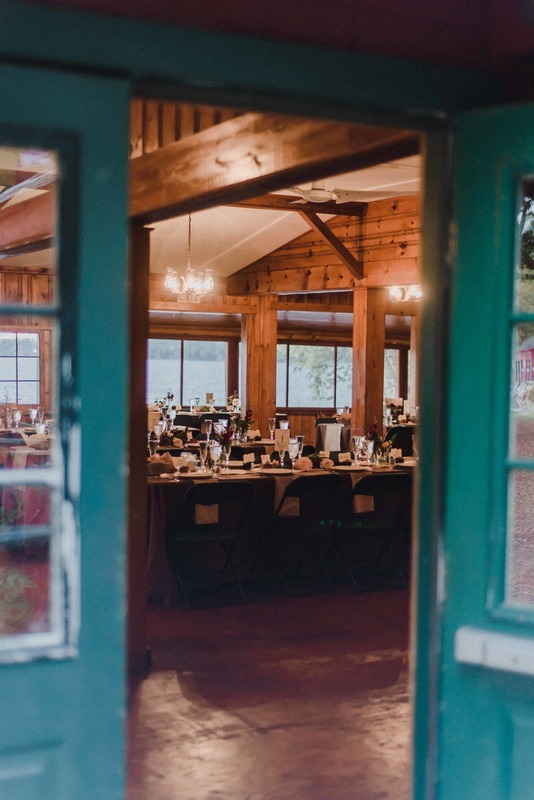 Kingsley Pines was the very last venue we saw, and we knew right away it was perfect. 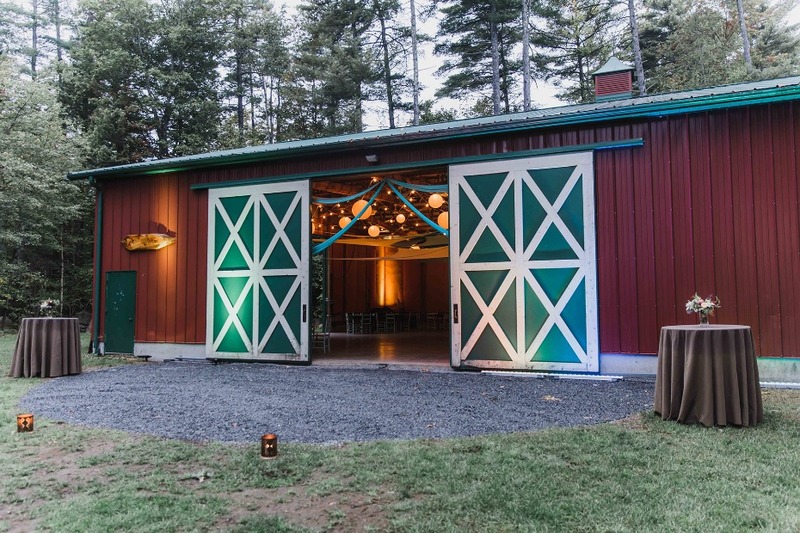 The cabins had a beautiful rustic esthetic with the right balance of comfort. 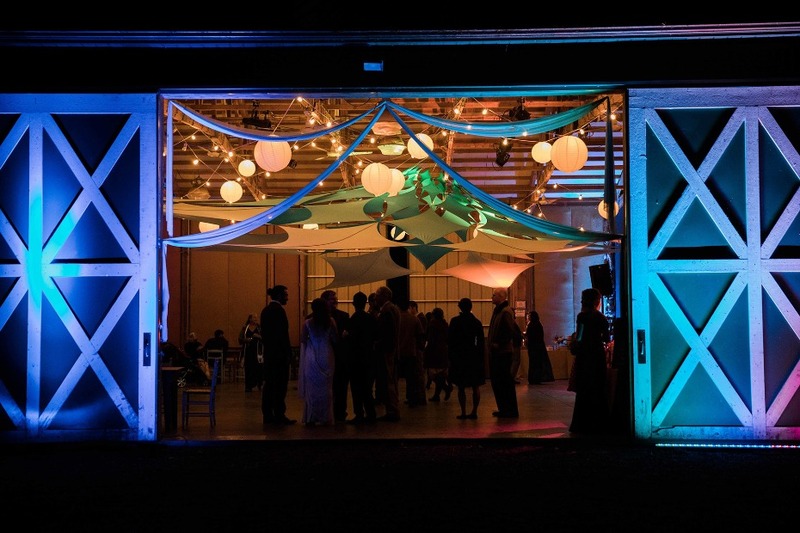 The camp sat aside a beautiful tranquil lake, where we could envision being married under the giant oak tree that stood by the shores, and knew the playhouse would be the perfect spot for after dinner dancing and entertainment. 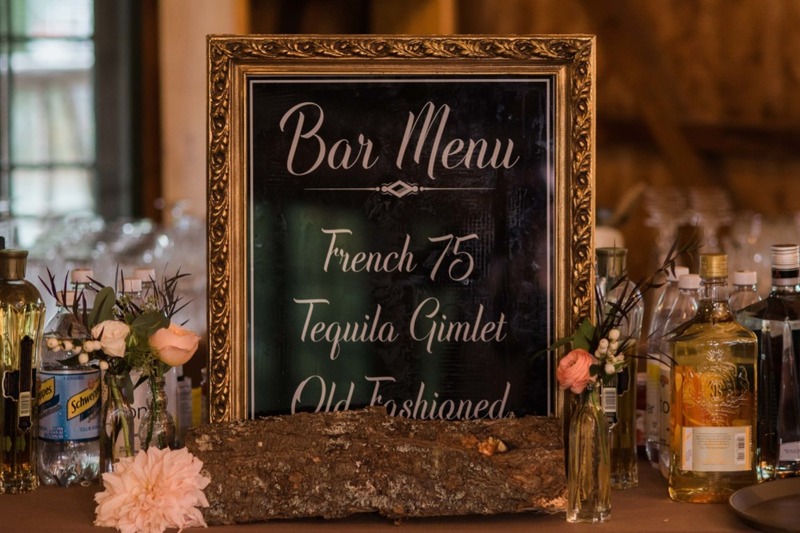 Cocktail hour was held in the main lodge with a sprawling wrap around deck while guests mingled around the roaring fire sipping Prohibition Cocktails, Old Fashions and a French 75. 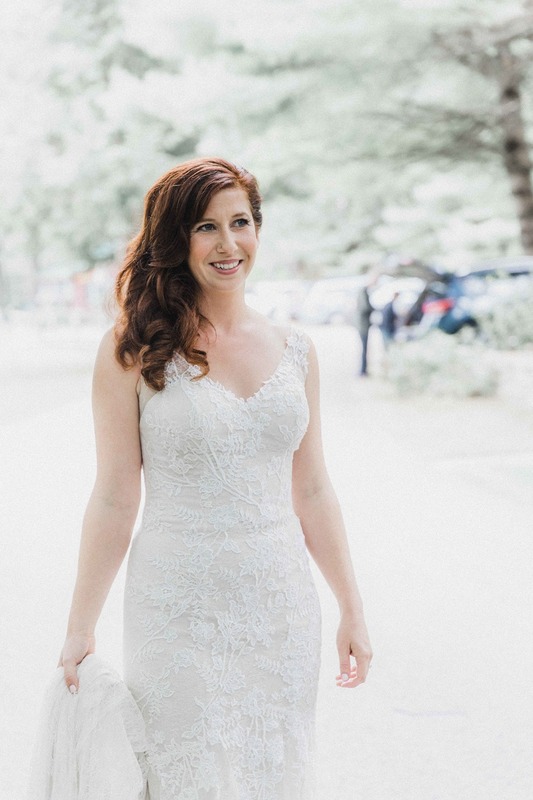 Alicia wore an elegant BHLDN dress featuring a plunging V-neck and matching back. 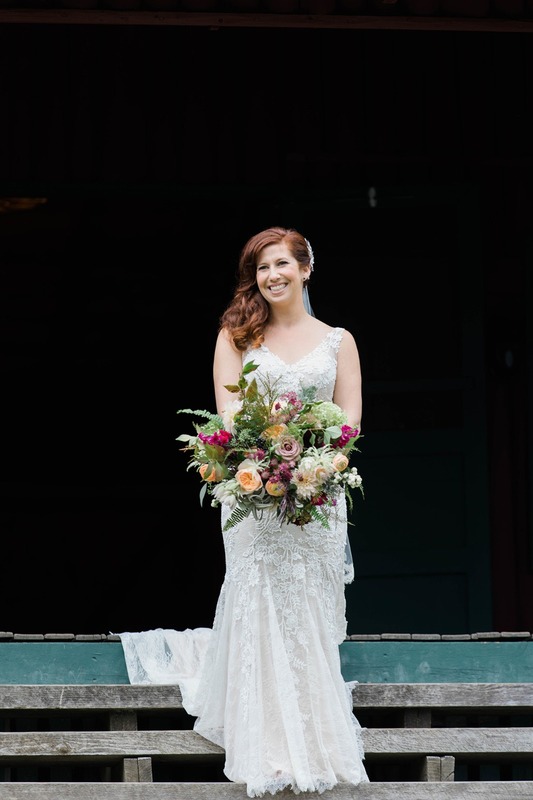 The gown was cut from intricate floral lace in a slim silhouette. It fell to the floor with a subtle flare and finished with a sweeping train. 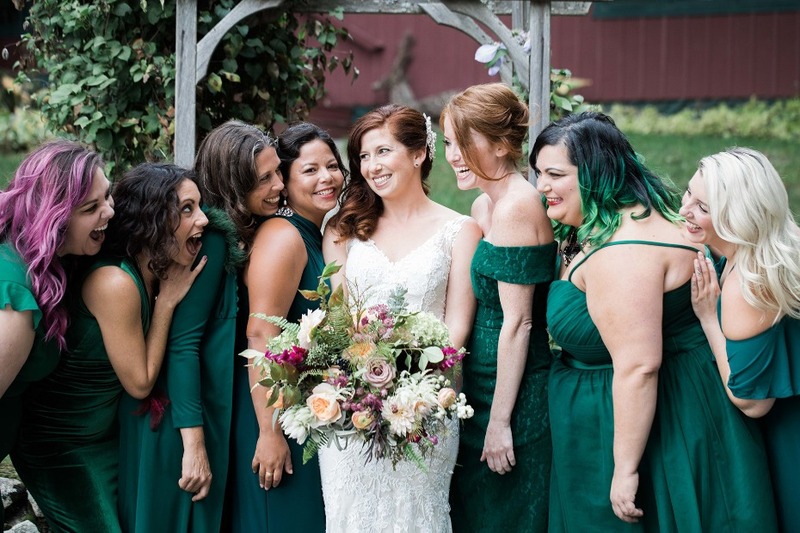 Alicia’s bridesmaid party consisted of 7 of her closest friends. Her vision was a mix of trends and textures. 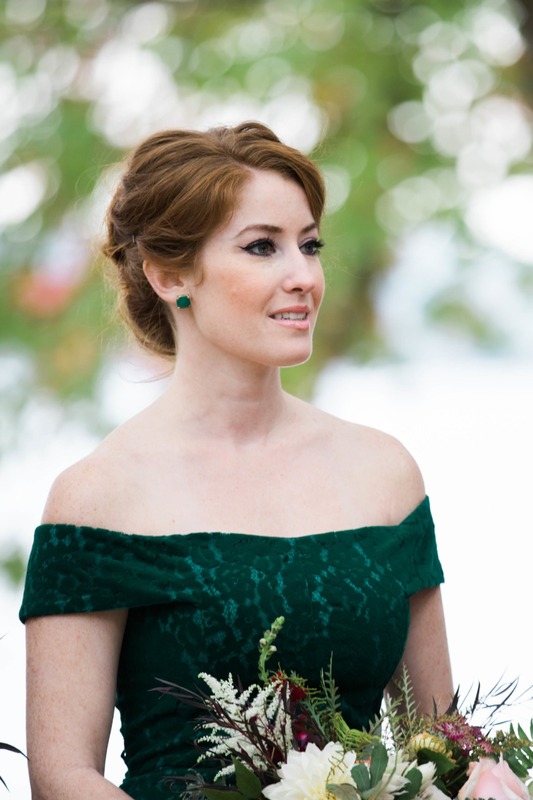 Each wore a floor length gown in forest green. 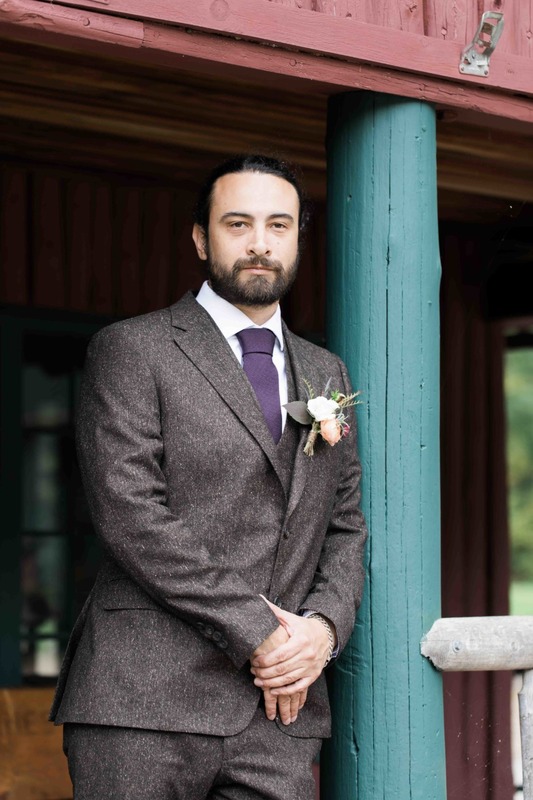 Dana wore a dapper, classic 3-piece rich brown tweed suit custom made for him from a local Cambridge shop outside of Boston. He wore ox-blood red leather shoes accompanied by dark purple neck ware from David Fin. 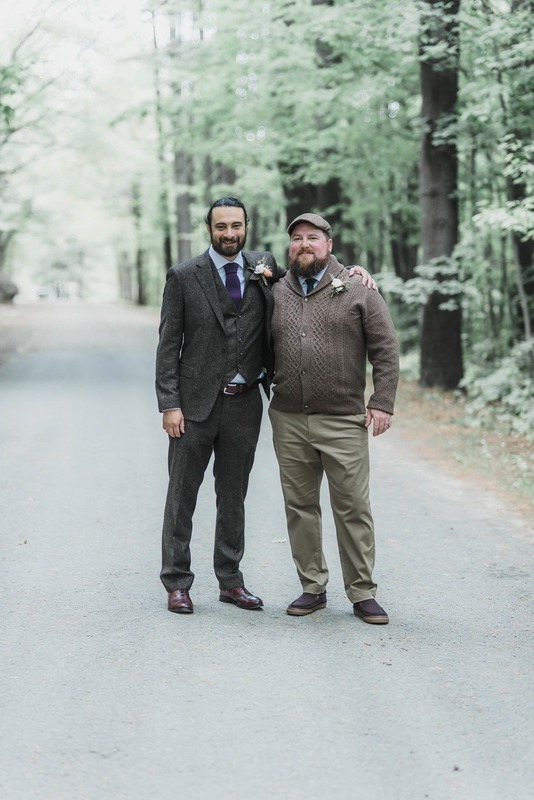 Dana’s groomsmen wore a relaxed brown shawl collar cardigan with a mix of forest green ties. 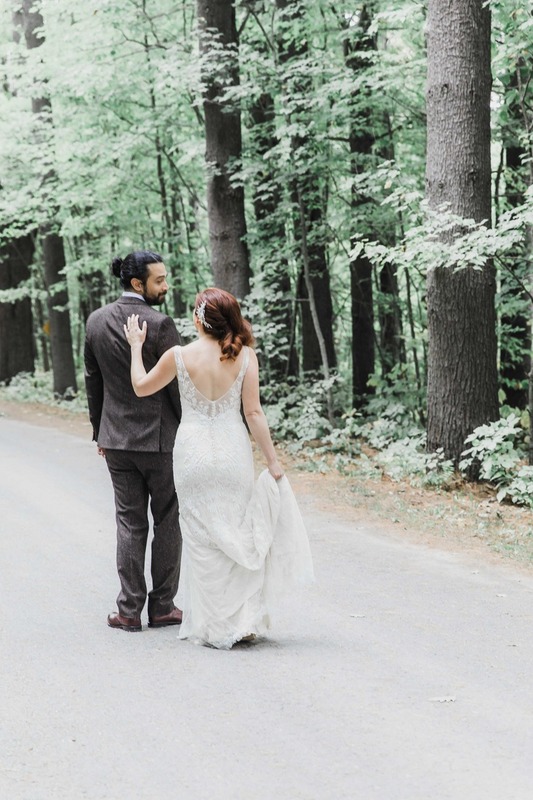 I wish I had planned ahead what time I wanted to bustle my dress, I left it unbustled for so long because I loved the look of the train but it made the dress start to feel very heavy. 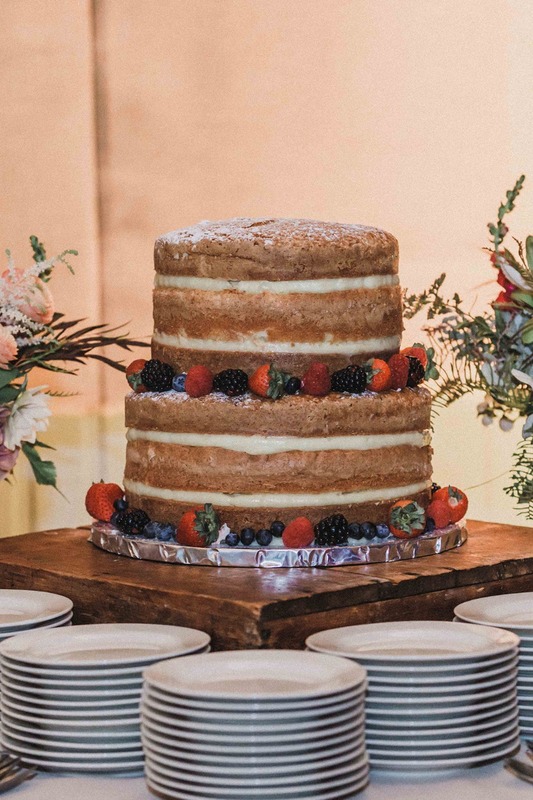 Also having everyone stay in the cabins on site, after dinner everyone disappeared to their cabins to grab sweaters rather than going straight to the barn to dance, so it took a while for a crowd to gather to cut the cake and have our first dance, I wish we had budgeted time for that and announced a specific time to meet at the barn to start dancing. 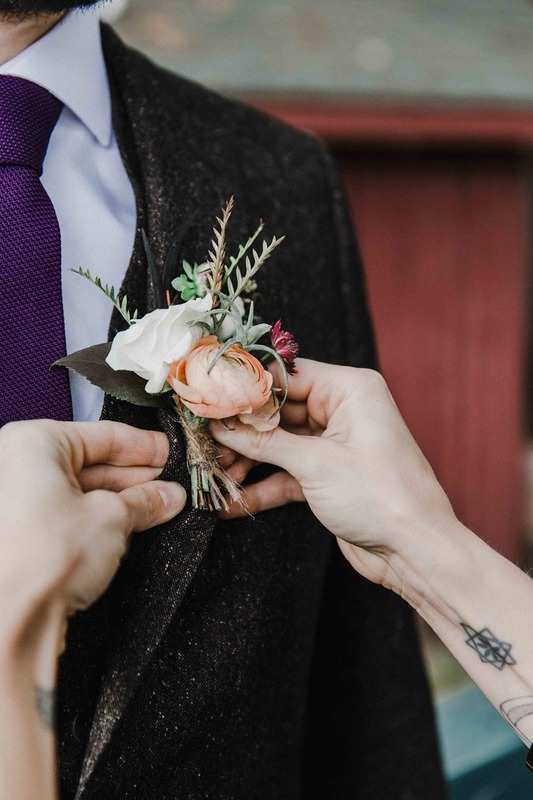 Gorgeous bouquets, boutonnieres, centerpieces and a ceremony installation of flowers sweeping across a large oak tree were crafted by a good friend and talented florist from San Francisco, Rare Sparrow. 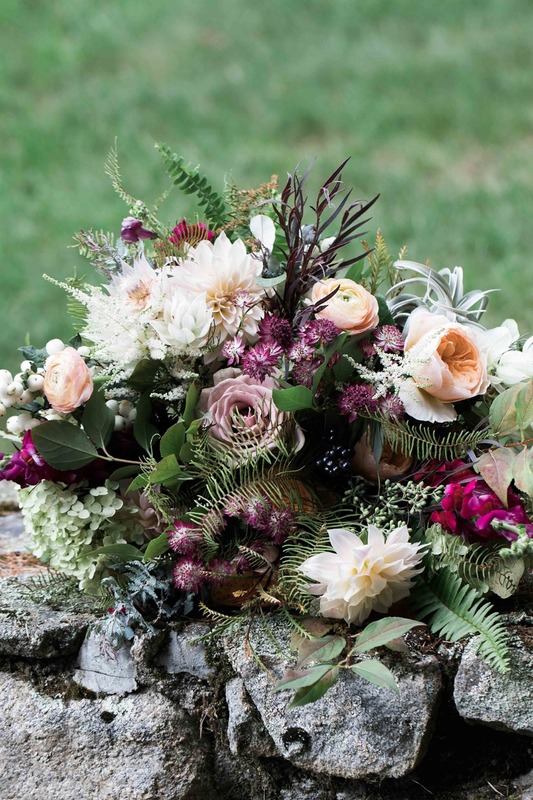 “We knew that the fall foliage would be beautiful, but we didn't want to overdo it.” Shannon helped us find a pallet of whites, creams, greens, light pinks, purples, and burgundy flowers that kept the essence of fall but didn't take away from the natural foliage.” Alicia’s bouquet was a mix of lots of texture, natural, earthy, and full of interesting unusual blooms. 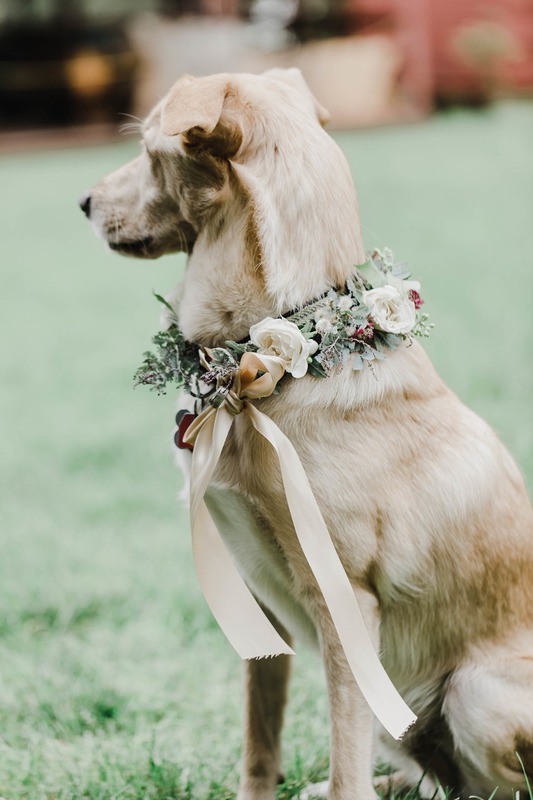 Their pup, Baloo, a "ring barker", walked down the aisle with a floral collar with ribbon to attach the wedding bands. 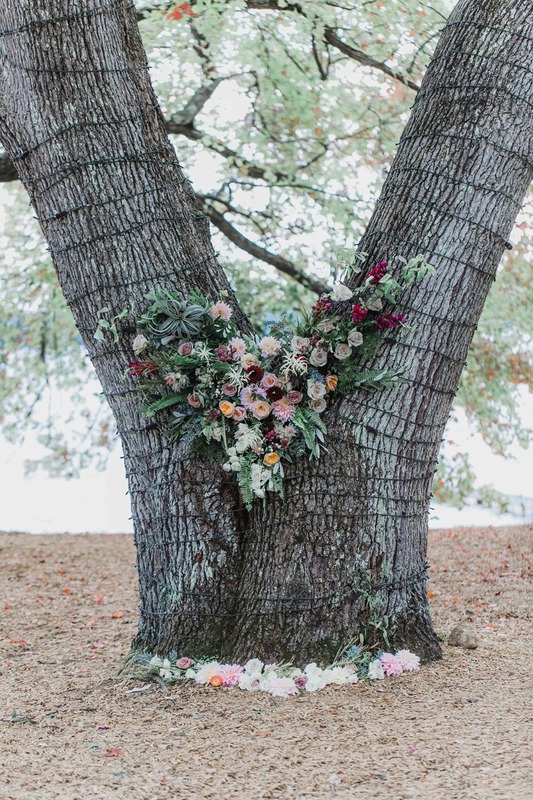 The ceremony tree was a masterpiece showing off the two main trunks joining together, draped with flowers. 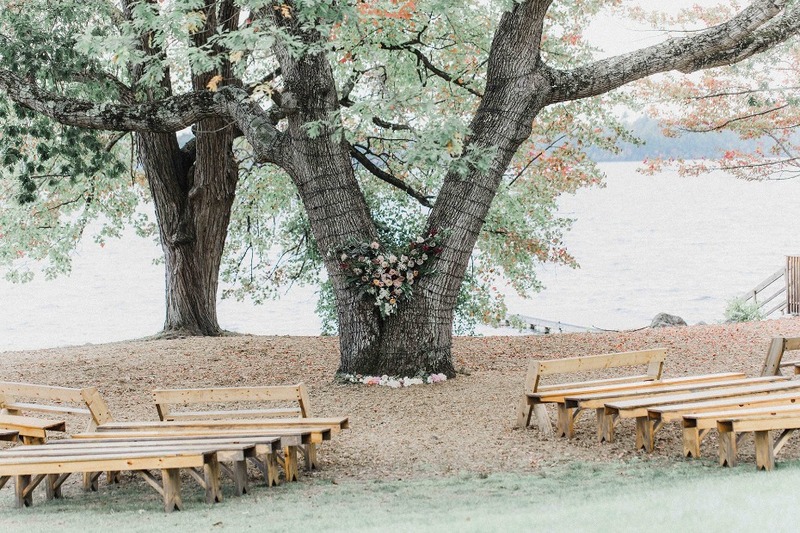 Guest sat on wooden benches and witnessed a gorgeous lakeside ceremony. We had two almost disasters. 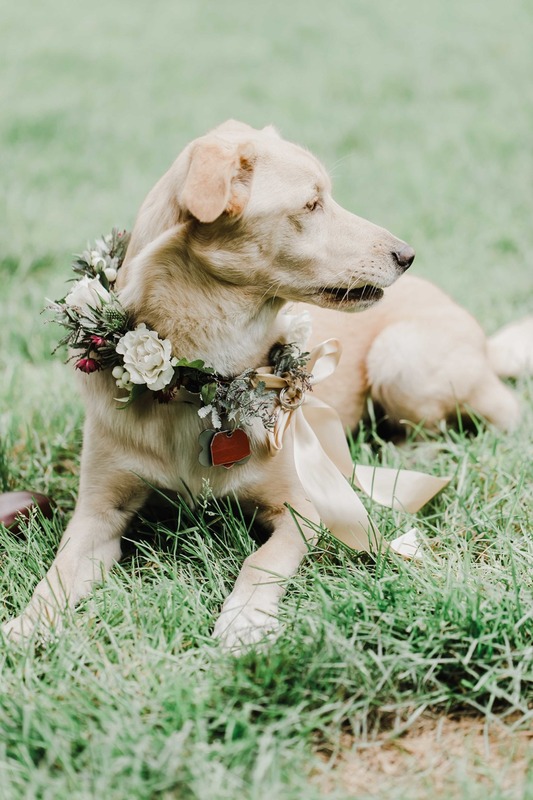 While I was getting ready our dog, Baloo, not only photobombed all the groom's pictures but when he was playing ball outside and ran into a fence cut his eye and was bleeding. 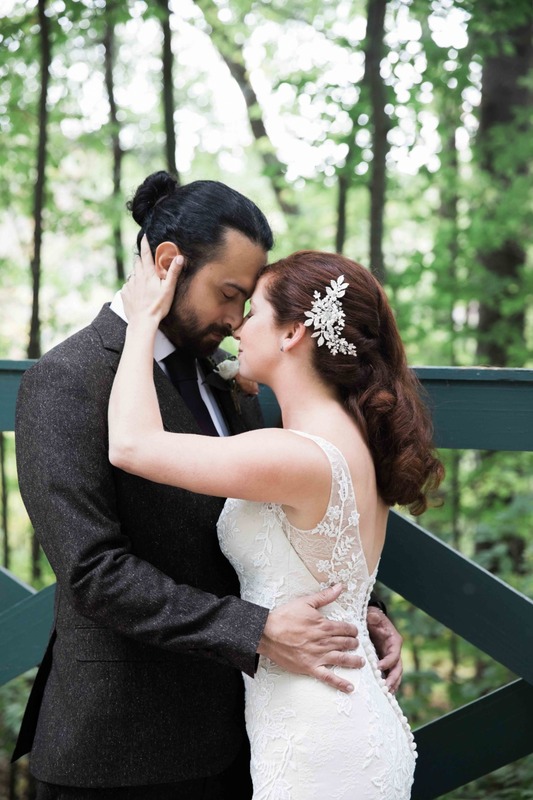 We had to stop with my hair and makeup for me to comfort him. The rest of the day he was a bit skittish so getting him down the aisle and keeping him still was a challenge, luckily the Best (Wo)man had a dress with pockets that she filled with treats to help entice him to stay in front of the crowd during the ceremony. 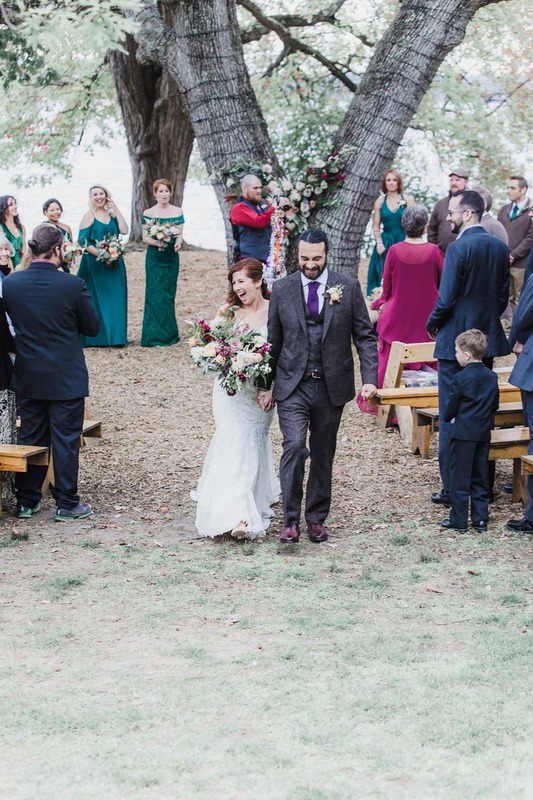 The other almost disaster was when we had the entire wedding party walk out onto the dock in the middle of the lake for pictures. We hadn't thought to weight test the dock other than having two people walk out there. Once we had 15 people out on, it started to rain, a jetskier stopped right behind us to watch and then the whole dock started to sink. 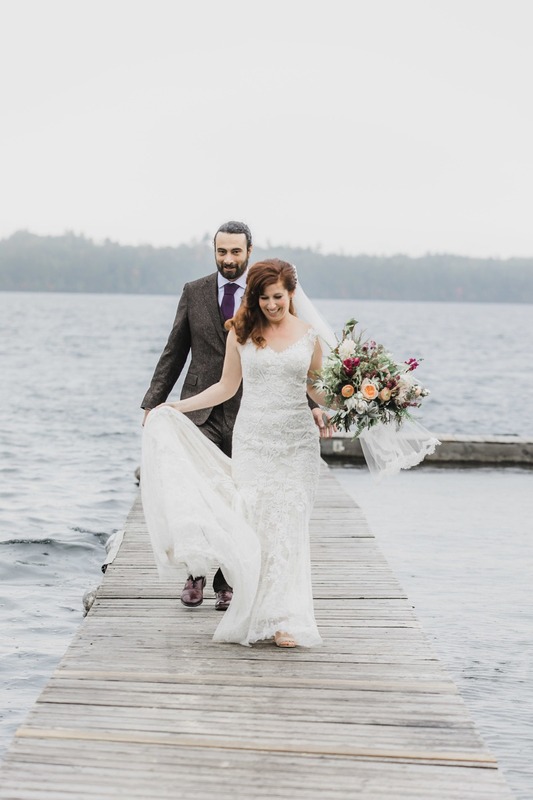 All the girls' dresses got wet on the bottom, but luckily we were able to have the wedding party slowly scoot off, and Dana and I got some beautiful pictures of the two of us out on the lake. 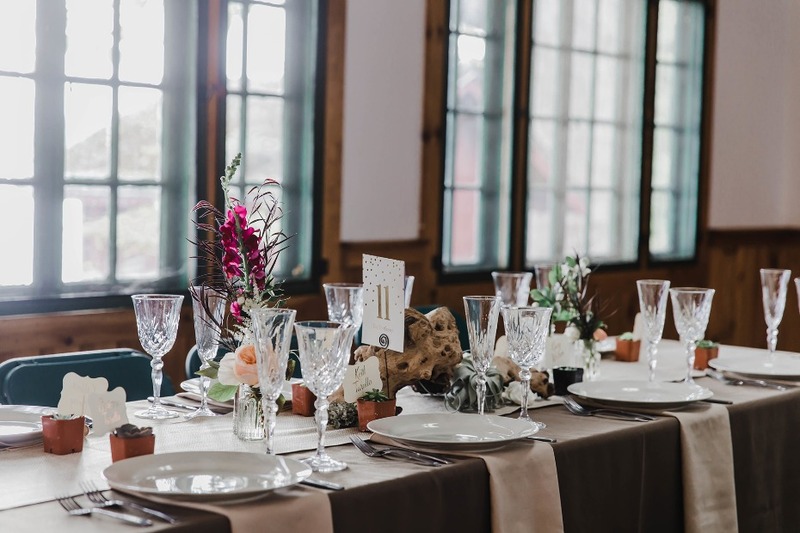 Dinner was held in a picturesque dining room with rustic appeal and romantic charm. 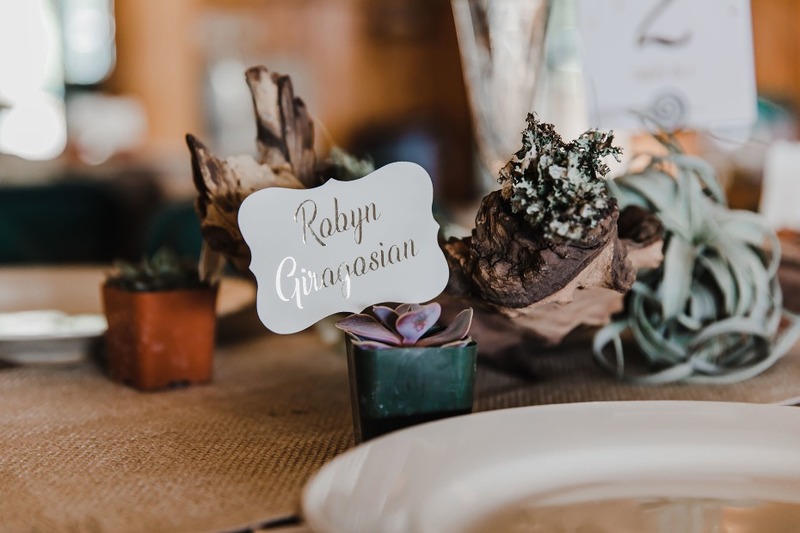 Alicia and Dana brought air plants they had collected over the years to incorporate with the rustic driftwood as part of the tablescapes, as well as in her bouquet. 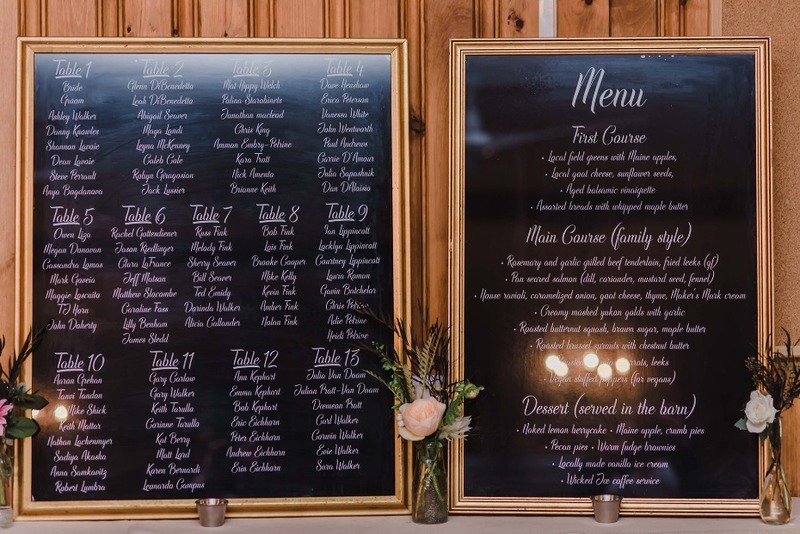 Dinner was served family style by 111Maine under dimly lit chandeliers and candlelight. 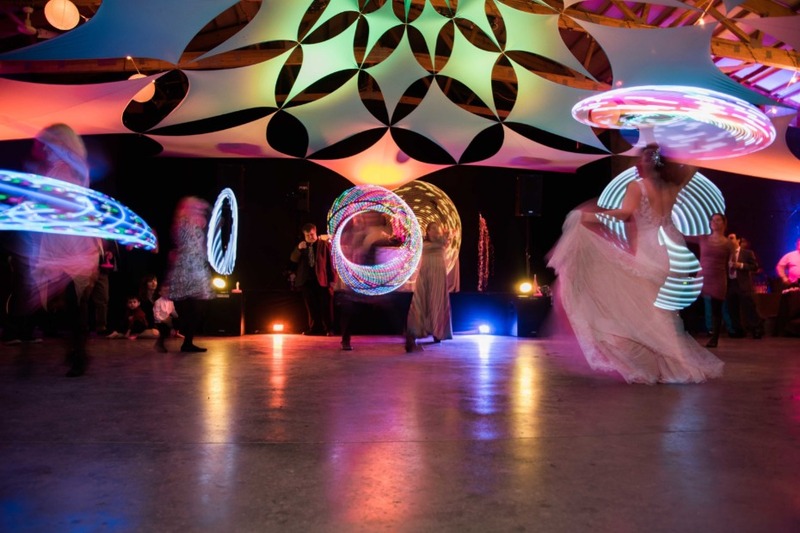 Speeches and toasts were made and the night concluded in the playhouse followed by cake cutting and a “hoop dance”. 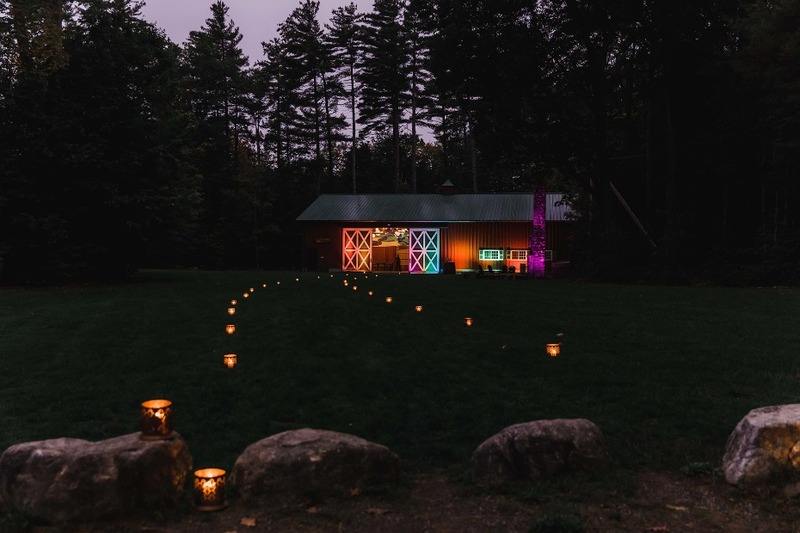 Candles lit the way to the illuminated playhouse, which had been transformed into a music hall, the high ceilings decorated with a handmade canopy and lots of colorful lights. 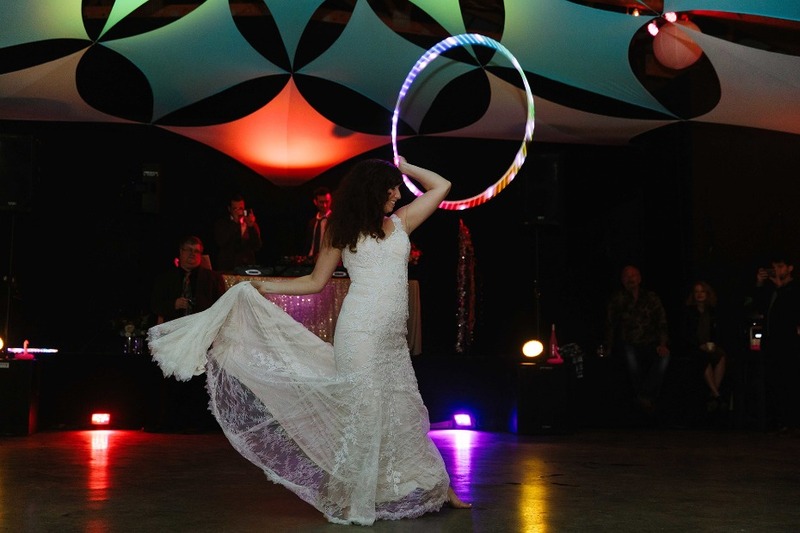 Alicia, a professional performer with a love of hula hoops, performed a hoop dance in her wedding dress.